Following our announcement about the Diana Eastment Roving Reporter Scholarship earlier this month, we can now reveal our topic for our Pre-Conference Event in Liverpool, 2019. Are you keen to innovate by providing timely, interactive and effective feedback? Do you want to find out which tools you can use to do so? Come join the LTSIG PCE to learn more about why, when and how. Feedback is a powerful and essential element in our learning and teaching journey. It highlights and reinforces our strengths and areas for improvement, and identifies specific ways to approach and change the way that we work. In fact feedback is so vital that studies conducted in the classroom have found it to have a significant impact on learning and learner satisfaction (Gibbs & Simpson, 2004). Beginning with a recap of the various types of feedback that can be delivered, the morning offers a consideration of teacher and technology merits, and how best to marry the two, before a closer look at the criteria on which to base the choice of tool that fits your context. With theory out of the way, the afternoon promises to be very hands-on and interactive with demonstrations of tried and tested technology before delegates have a go with the tools themselves. Our speakers will be announced soon. Watch this space! 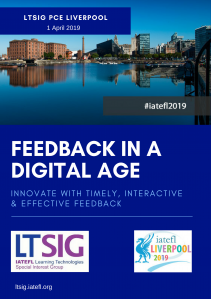 So, if you would like to find out how to increase choice, engagement and flexibility with paper-free feedback, and leave with some tools and tasks to do so, come and join LT SIG and the discussion about effective feedback in a digital age. Text by our Events Organiser, Nikki Fortova.